Two weeks before Easter last year, Pastor Rick gave us a challenged. He asked us to write down the name of a person we would like to invite to a Saddleback Easter service, and he said that he and our campus pastor would join us in praying for them. Saddleback has been my church for many years. When I walked into my first Saddleback service, I felt like I had found a home. So Pastor Rick’s challenge hit me as I realized that I shouldn’t remain quiet any longer about the relationship I had with God — the same relationship that was available to anyone who came to believe in Jesus. They too could find a home, a place of peace where they could learn more about the God who really loves them. The only problem was, I couldn’t think of anyone specific to invite. I felt guilty about the “Christian bubble” I lived in and the very few nonbelievers that I knew. I sat in the service and asked the Lord whom I could invite, and in that moment I felt God give me an idea. It had been almost four months since I had driven myself because I was recovering from a surgery. 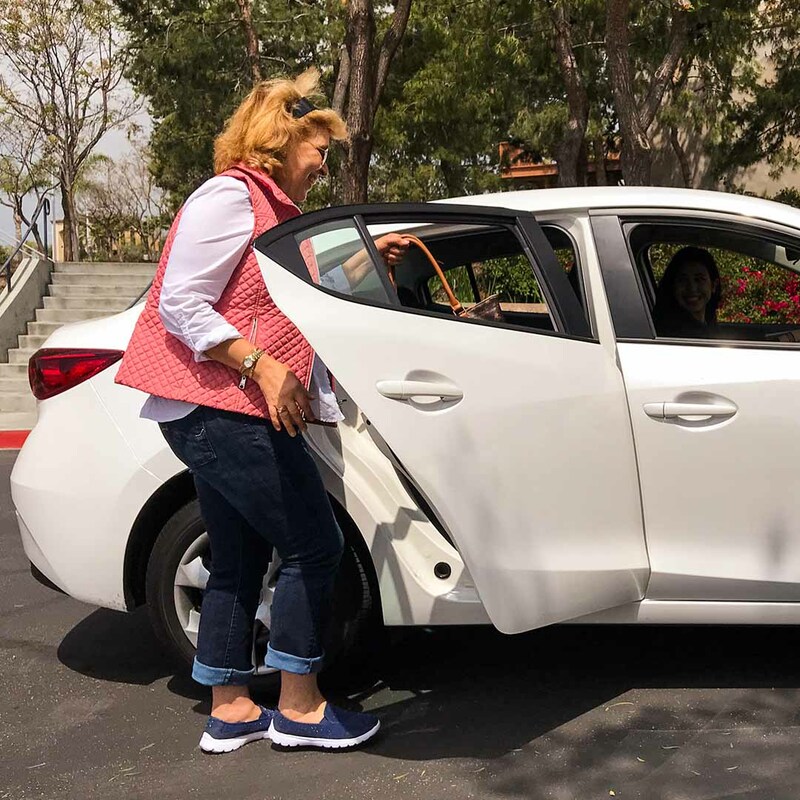 Many people had stepped up to drive me to my follow-up doctor and therapy appointments, but there were days when I had to rely on ride-sharing services to help me get from here to there. My first opportunity would be that afternoon on the way home from church. I took a moment to count up the number of rides that I would need to take during the two weeks leading up to Easter. I counted 17; I would have at least 17 opportunities to invite my driver to one of our Easter services. My first opportunity would be that afternoon on the way home from church. I explained to Jeremiah, my campus pastor, what I was going to do, I was apologetic because I couldn’t give him the specific name of a person. I could only tell him that I would be inviting 17 unnamed strangers. I asked the seven simple words, which brought up a discussion about his home life. I found out a great deal about my drivers. Albert lived in Riverside. I told him about our nine services at Saddleback’s Anaheim campus, and because I didn’t know the schedule of services for all our campuses, I pointed out the website listed on the invitation and told him that he could find the campus closest to him by entering his zip code. Before I left his car, he asked if I had any more invitations that he could have so that he could pass them out to his future passengers and let them know what we were offering. My mind reeled, and I said, “Of course!” as I handed him a stack of invitations. My next driver, Alimayu, was born in Ethiopia. I asked the seven simple words, which brought up a discussion about his home life. Alimayu was divorced but spent his free time taking care of his mother. He told me about growing up in East Africa, and I remembered that I had learned a song in Swahili when I was younger. Pastor Rick has often said that people won’t care how much you know until they know how much you care. I sang the song for him in the car. It really touched him that I had taken the time to learn a language from his home country. This simple moment we shared gave me the platform to tell him about Jesus. As the week progressed, I had many opportunities just like that one. I may only have learned how to say “Hello” in someone’s native language, but I was continually surprised how it opened doors of receptivity. Whoever my driver was, I found myself looking for things we had in common — it was a little like being on a scavenger hunt. When I found our common ground, my drivers became people I really cared about, which was the best thing of all. Then, something curious happened. I started to see all of the nonbelievers who were in my life. Out came the invitations, and those seven simple words were repeated time and time again. Admittedly, some of the responses were a very definite “no.” But the “no” never stopped me. I had a doctor’s appointment during those two weeks leading up to Easter, everyone — from my surgeon to the physician’s assistants to the physical therapy staff — received an invitation. For some reason, I was especially excited about inviting the office receptionist. Dahlia told me that she and her boyfriend had just moved into the area and were thinking about finding a church. She told me that the problem was that her boyfriend came from a religious background that required him to go to church on Saturdays. I got excited and said, “Hey, no problem! We have services on Saturdays!” Dahlia was thrilled and said that she and her boyfriend would definitely be there. Of all the invitations I handed out during those two weeks, there are three drivers I won’t soon forget: a hard-of-hearing man that I was able to communicate with using sign language, and my last two drivers. The last two unforgettable encounters happened after the March 29, which is when my surgeon gave me permission to begin driving again. Saddleback Anaheim was having a time of prayer for the Easter services and for all of the people who would be walking through our doors or showing up at Angel Stadium. I was so excited to drive to this prayer event, but I couldn’t shake the feeling that it was wrong for me to drive, that my evangelism wasn’t over. I walked out to my car, got in, and turned the ignition. Nothing. Crickets. My battery was dead. Absolutely crystal-clear direction from God! I let out a very loud, “Woo hoo!” as I reached for my phone to request a ride. I had begun to view my world in a whole new way because it was my own eyes that needed opening — through seven simple words. The driver who picked me up, Jason, told me about his mother-in-law who has stage 4 cancer. He was a Christian, and the two of us stopped and prayed for his mother-in-law and her family. I did invite him to Easter, but even more important was sharing a moment of prayer with him. The last driver I met before Easter was also a Christian, and I was able to pray for him. It was the perfect way to end my pre-Easter evangelism. To be honest, I don’t know if any of the 31 people that I invited to our Easter services actually showed up. My job was to invite. I know that if they had come, they would have heard an awesome message that clearly shared the good news about Jesus. And for me? I had begun to view my world in a whole new way because it was my own eyes that needed opening — through seven simple words. Visit saddleback.com/easter to download Easter images and invitations that you can share on Facebook, Instagram, and Twitter to invite your friends and family to Easter at Saddleback.